The Avantgarde Duos are far and away the most fascinating and formidable speakers I've yet encountered. Judging by impressions -- at trade shows, dealers and now in my home -- they also belong to a small group of speakers whose in-room performance, from mediocre to world class, can vary to the extreme. As tweak maestro Lloyd Walker reminds us, "The devil's in the details." After initial assembly, Avantgarde-USA's sales manager Casey McKee casually parked the Duos in the same spot my resident Triangle Ventis XS speakers had just vacated. He programmed an ocean/surf CD for endless repeat (much more pleasing than annoying frequency sweeps or pink noise) and excused himself for serious setup duty until the next morning. Once McKee had left, I hastily ejected the virtual Fiji hologram from my audio command deck. In went a few of my customary demo tracks instead. If first impressions matter, the Avantgarde Duos remained blissfully unaware of this self-conscious concern. They sounded mediocre and were handily bettered by my $4000 Triangles. Tonal balance was remiss, soundstaging confused, and coherence sorely lacking. I restored the peaceful oceanic ambiance of crashing waves, turned off the light and scratched my head wondering. Armed with tape measure and torpedo level, the first order of business was aligning the path lengths of the speakers to within a 1/4" of my listening seat while doing the same to placement distance from the side and front walls. McKee then opted for his favored toe-in, which turned out to be spot-on: the Duo's two outer upright supports were offset toward the listener's eye such that the tweeter module's outer rear mounting bolt barely touched the inside of the closer pole. This creates approximately eight degrees of toe-in. Tweeter alignment was readily confirmed when the outer rear fastener aligned behind the front fastener and verified horizontal on-axis positioning. Since the Duo's sealed-bass module is active, further adjustments remained -- subsonic filter setting (with options at 20, 25 and 30Hz), relative phase, crossover frequency, and gain. It is with these variables that very subtle actions can spell the difference between impressive hi-fi and revelation. My space has a bass hump in the 35Hz band -- the 30Hz subsonic-filter setting proved curative to room boom. Reversing polarity on the woofers spelled superior integration. The low-pass center frequency is 140Hz. If we assigned values of a clock's face to the markers for this adjustment, nine o'clock would equal 90Hz, and three o'clock 190Hz. Advancing from nine to ten o'clock then equates to roughly a 17Hz step, or going from 90Hz to 107Hz. Even finer adjustments are possible by setting the knob between the hour markers, for approximately 5Hz increments each. This means that deciding at what specific frequency the midrange horn should hand over to the subwoofer module for best in-room integration becomes fine-tunable in 5Hz steps from 60Hz and 220Hz. The attenuator demarcations are equally subtle. Differences of 1dB in bass output relative to the horns will significantly impact tonal balance. Having a friend calibrate the controls while you hog the hot seat is mandatory for best results. McKee became my experienced audio slave for an hour. Since the mid horn's high-pass at 170Hz is rather elevated in frequency, an unadorned vocal track helped determine the woofers' appropriate low-pass setting. After exploring minute incremental changes -- specific settings will obviously vary from room to room -- and playing his own music, Casey McKee pronounced his job complete. He left town feeling comfortable that within my system context (smaller room than his own, equivalent amplification in the Art Audio PX-25 and Audiopax Model 88s, less cutting-edge source componentry than his personal dCS gear) the Duos performed to their fullest potential. Settling down afterwards with my lonesome, everything sounded positively mind-bending except for a slight discontinuity of character between bass and midrange. It wasn't a function of speed, but textural striations that caused leading edges in the bass to be too sharply pronounced. This didn't blend with the effortless nonchalance of the horn-covered spectrum. A quick phone call to Avantgarde-USA's proprietor complained about "bass most audiophiles would kill for." I explained that to my ears, live acoustic bass always features slightly fuzzy contours and a certain warmth, not this dry, razor-edged and slammin' demeanor. Jim Smith understood and laughed. He appreciated my disdain for over-damped, realer-than-real, hi-fi bass. He suggested final adjustments to the gain setting. Amazingly, backing the subwoofer gain off by just a few clicks caused this textural discontinuity to recede like a relief melting down into its surroundings. If you prefer ultimate attack and toe-curling slam instead, the Duos willingly oblige with the flick of a switch. Apparently because of their tightly focused dispersion (not to be confused with the hyper-beamy, head-in-a-vise syndrome) the toed-in Avantgardes performed exceptionally well within close boundaries. The outer lips of the midrange horns ended up 17 3/4" of the sides and 56 1/2" of the rear, placing the far corners of the subwoofer module 27 1/4" inches into the room. At 13'W x 19'D x 10'H (and inspected by McKee prior to picking the Duos as the suitable Avantgarde model), my space proved perfectly adequate -- rather shocking when you consider the speakers' size. However, their vertical driver offset mandates a minimum distance of about 11 to 12 feet so that the sound converging at the listener's ears becomes a unified wave rather than individual events. The Duos distinctly are not nearfield speakers. A neighbor raised on Quads summarized his initial impressions perfectly: "These speakers sound so huge and exciting -- they force you to pay attention." Indeed. This isn't subdued or polite bonsai audio (though I'm sure that less-than-careful setup could downplay some of this very tangible involvement). But why complain when thoroughbreds race like streaks of lightning? My most immediate reaction was one of utter ease and profound naturalness. This not only annihilated any concerns over cupped-hand colorations but also convinced me that distortion levels were astonishingly low -- the usual telltale signs of artifice (texture and grit) were keenly lacking. Surely the physical separation of the driver modules eliminated common cabinet fuzz and resonance intermodulation. Also, horn loading obviously avoided any kind of stress since the transducers were barely moving. The next surprise belied the Duos' obvious size -- they remained utterly invisible as apparent sound sources. From a psychological perspective, this was perplexing. My eyes clearly validated what my ears refused to acknowledge -- that this wall of sound had to emanate from somewhere, right there. Not! Another revelation occurred with microdynamics. On familiar recordings, the most minuscule of fluctuations in a singer's emphatic nuance, on a bow's pressure or a woodwind's air speed and reed grip, were rendered with previously unresolved movement. Beside the marvelous effortlessness, this contributed greatly to the Duos' much-enhanced sense of live listening. The performers weren't merely playing notes. They were communicating intent, purpose and emotions. They were using their temporal sonic substance like plastic, shaping and molding it in the moment to convey subtlety and personality. Dynamic peaks -- depending on recordings -- could be downright scary. Unless you listen to classical music or audiophile pressings, though, this spooky capability is probably less of a real-world asset than the phenomenal agility and scope of microdynamics. Still, startlingly explosive transients and instantaneous leading edges, especially with percussive instruments (including piano) and strings, were obvious on all manners of albums. This immediacy coupled to the physical height created a projection that was most assuredly tall and very much present. It's easy to forget (and get used to) how most systems scale down the musical event for pocket-sized casual consumption. Because it's been tamed and dynamically homogenized, such playback no longer demands our undivided attention. If (like my Quad-oriented neighbor) you prefer nibbling on your aural buffet, the Avantgardes will remind you of a newborn baby: you'll be promptly awakened whenever you drift off. Don't mistake this intensity for in-your-face sonic attacks. Via my beloved SET amps, soundstaging extended far behind the speakers, never up front. It was completely organic, without edginess or artificial holographics. My favorite attributes of the Duos were their veil-less directness; the intense wealth of aural colors and hues that resulted from superior resolution, absentee distortion, and blazing responsiveness to the tiniest of dynamic pressure changes; and being the beneficiary of superbly controlled low-20Hz bass for those trance and ambient albums whose soundscapes are built upon subterranean cues. One side effect of 100+dB speaker sensitivity is potential system noise. While I'm aware of the deleterious effects of dimmer-controlled lights, I never suffered them in my present room. With the Avantgardes, dimmer buzz (despite all components being plugged into a power-line conditioner) was audible even when the dimmer pot was opened all the way. I also had minor power-supply grunge from my stock Art Audio PX-25 amp. The manufacturer routinely modifies the gain structure of his amps for Avantgardes, in which case (according to their principals who use them) they are deadly quiet. My stock unit was respectably but not perfectly noise-free. The powerful Bel Canto eVo 200.4, even in non-bridged mode, required gain attenuation via in-line load resistors to eliminate audible noise. Only the Audiopax Model 88s behaved flawlessly in this persnickety respect. Clearly, the Avantgardes demand superior preceding ancillaries as their awesome efficiency can mercilessly expose upstream blemishes. Incidentally, the low-power Volksamp Aleph 3 and 47 Labs GainCard are solid-staters rumored to be highly copacetic. Still, superior single-ended valves really seem the way to go. The Avantgarde Duos remind me of something bespoke and hand-tailored. If you've never been fitted for a boot or customized mountain bike, you'd happily buy right off the rack. The Duos' pronounced sensitivity to placement and subwoofer adjustments requires hands-on attention and thereby offers a straight path into the heartland of dream gear. The problem lies in unwittingly stopping shy of perfection -- you will get shortchanged if you expect turnkey bliss. This inherent variability might explain why I've observed Avantgarde speakers at various dealers' perform occasionally less than impressively. The drastic before-and-after changes due to Casey McKee's tireless guidance suggested that a personal audition with one of Avantgarde's principals, in Atlanta or Austin, could be the front-row ticket for hearing the speakers utterly unleashed. As for me, I am already convinced here and now. If you want the music to grab you by the short 'n' curlies, to commune with you most intimately, these Avantgardes might be your personal hotline to the aural deities. They're for folks who want personal visitations, goose bumps, butterflies in the belly and the occasional heart-stopping scare. In short, they're exactly my kind of breathless fantasy audio device. The Duos thus get my vote for personal audio-lust objects of the year. Duo 2.1, custom automotive metallic lacquer finish with Nextel 225 CTRL subwoofers, $15,970 per pair; Duo 2.2, custom automotive metallic lacquer finish, with matching lacquer finish 225 CTRL subwoofers, $16,970 per pair. Warranty: Five years parts and labor; one year on electronics; ten years on finish. We don't take lightly the special honor of receiving your Reviewers' Choice designation. You don't bestow that recognition on many products, and when you do, it actually means something. Of course, all of your hard work on the behalf of the audio community is deserving of an award as well, but nobody ever gives those out, do they? Avantgarde-USA was pleased to be able to submit the Duo 2.2s to Srajan Ebaen for his review in "Earmarked!." Your readers might be interested to know that the Duo is far and away the best-selling model in our line, outselling the much more widely reviewed (and more affordable) Uno by almost 2-1! I believe that Srajan touched on most of the reasons why the Avantgarde family of owners continues to grow quite nicely. You don't see that many for resale, and when you do, the owner is often moving up to the Duo or Trio. The Duo Hornspeakers are the primary reason I came back into the high-end arena. Once I heard them, I knew that music lovers simply had to have this experience. 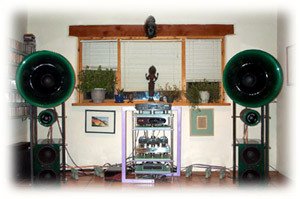 With almost 30 years in high-end audio, I had never experienced such musical intensity from a music system. The only way I can describe the effect is that these speakers won't let go. Forget about listening to a song or two, or using them for background music. Since they don't need 50 watts, just to "prime the pump," they sound effortlessly alive, even at low levels. And then you get hooked. For instance, as I observe it here in Atlanta, folks who come to listen are nearly always unnerved. They expect the typical audiophile experience. They don't expect (no matter how much I try to prep them for it) an almost direct communication with the performers. Finally, they get it -- these speakers transcend the normal high-end, audiophile expectations. The effect is intense. Anyway, we are pleased to see/hear that Srajan had the same experience. Sometimes when you run into something that's so fundamentally beyond the norm, it's good to have others confirm that you're not exactly crazy!